The skin of people with eczema is more sensitive to irritants (such as soap) and more at risk of infection. A child is more likely to develop eczema if there is a family history of eczema, asthma or hayfever. How long can eczema last? 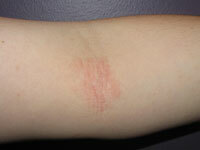 You can control eczema with treatment and by avoiding 'triggers'. Eczema can be controlled with treatment and by avoiding things which can trigger your child's eczema. There is a good chance that your child's eczema will improve or disappear as they get older. What puts my child at risk of getting eczema? How can I manage my child's eczema? You can easily manage most eczema at home. Removing foods from your child's diet does not usually help eczema. Removing foods from your child's diet does not usually help eczema. Please discuss with your doctor. Are there likely to be any complications of eczema? Children with eczema are more likely to get skin infections. Eczema makes the skin dry and cracked and increases the chance of infection by bacteria and viruses (especially the cold sore virus). Infected eczema may be wet, crusted or painful. See your doctor for treatment. If your child's eczema gets worse or becomes infected, you will need to take them to your doctor. Sometimes, a hospital stay may be necessary. 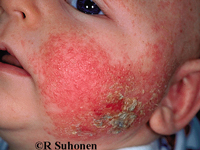 Images of eczema on this page have been reproduced, with permission, from the website of the New Zealand Dermatological Society Incorporated. Published online at: www.dermnetnz.org. Includes a section on tips for keeping eczema under control. Call free on 0800 34 0800. Includes information about infantile atopic dermatitis, atopic dermatitis in pre-schoolers and atopic dermatitis in school-age children. This page last reviewed 13 January 2016.